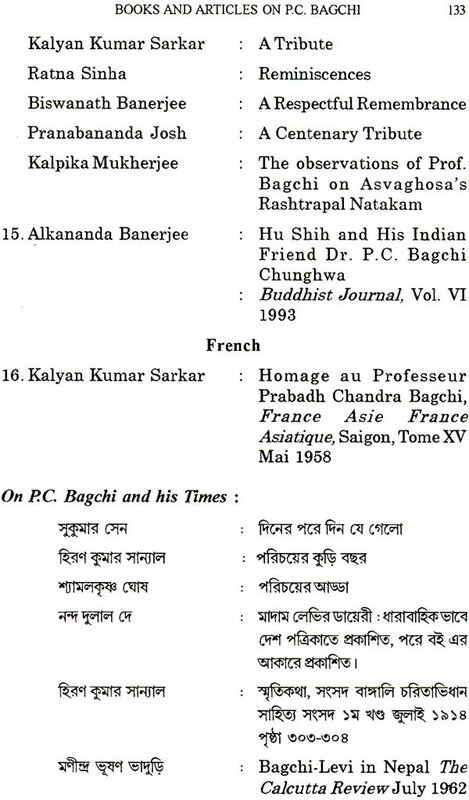 Professor Probodh Chandra Bagchi’s contribution on Sino-Indo Tibetology was the topic of the National Seminar held by the Asiatic Society on 18th November 1998. This Seminar was organised to mark the birth centenary of Professor Bagchi. 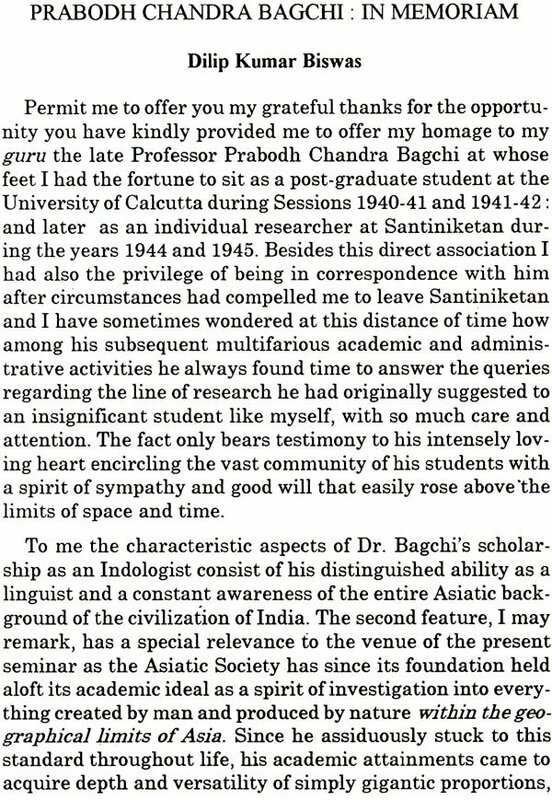 Professor Bagchi was an Indologist in its true sense, a genuine Linguist, and the greatest of the Sinologues. He had ingeniously mastered the classical languages like Sanskrit, Pali and Prakrit. He also acquainted himself with Tibetan and Chinese. He had also enough working knowledge of English, French and German. He has proved himself to be the true disciple of Professor Sylvain Levi, as he had thoroughly studied the historical materials on India available in Chinese records. His investigations into Indological researches moved principally through Tibetan and Chinese sources. The seminar was attended by a galaxy of scholars many of whom were closely associated with Professor Bagchi. The papers presented during the seminar focus on various aspects of Professor Bagchi’s scholarship. We have received nine informative papers by nine eminent scholars who have made their marks for a long period and whose erudition has brought for them high respect from the academic world. We are publishing these papers in a book-form keeping a view to acquaint the present and future educators and educatees with different aspects of the researches Sinology carried on by Professor Bagchi. This compilation comprises two parts : The first part contains papers presented at the P. C. Bagchi Centenary Seminar at the Asiatic Society on 18 November, 1998. 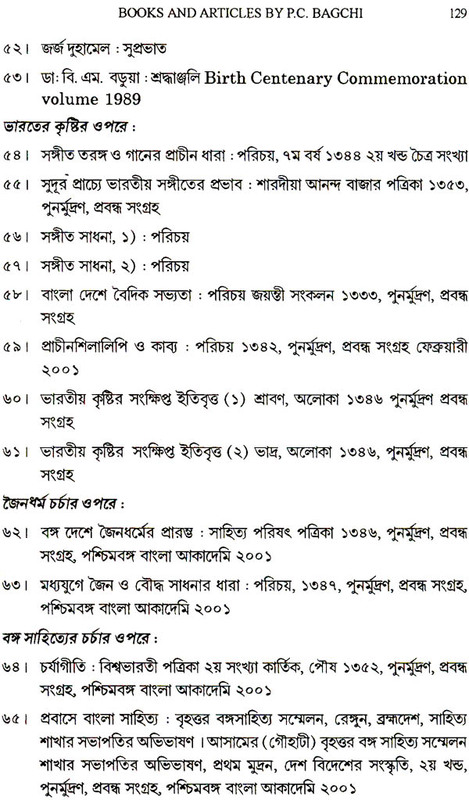 The second part includes, (i) a chronicle of Dr. Bagchi’s life, (2) bibliography of his books and articles written in French, English arid Bengali languages: (3) books articles on Dr. Bagchi, and (4) two addresses by Dr. Bagchi enunciate his ideas on education and social work. To top them all, one rare photograph has been included to enhance the value and relevance of the publication. For all the materials of part two we express our gratefulness to Ms. Ratna Sinha, daughter of Dr. Bagchi, who has all along been tirelessly striving to perpetuate the memory of illustrious father through publication of his published and unpublished writings. Professor Samaresh Bandyopadhyay has kindly supplied the photograph for which we are grateful to him. Our sincere thanks are due to Professor Haraprasad Ray who has tirelessly gone through the articles and edited the present volume in a befitting manner. The Publication Department deserves special credit for publishing the volume within a short span of time from the receipt of all the materials. 18 November of 1898 was a significant date in the history of Asian Studies, for on this day was born the outstanding pioneer of Chinese Studies in IndiaDr. Prabodh Chandra Bagchi. 2. 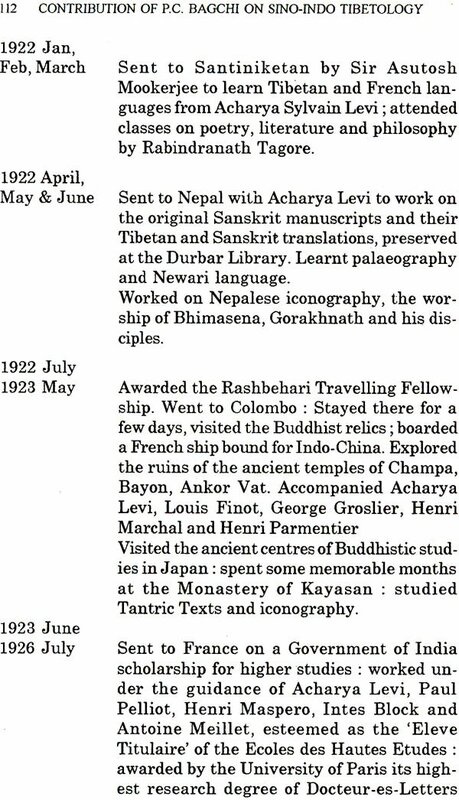 Study of archaeological objects such as coins, inscriptions and other .monumental remains to study Buddhist literature and philosophy and many other aspects of Indian cultural exchange covering wide range of subjects, Thus, the life and work of Dr. Bagchi are convincing examples of what a perfect Sino-Indologist stands for. To commemorate the memory of Professor Bagchi a series of centenary celebrations were held in Kolkata. One such occasion was organised on 18th November, 1998, by the Asiatic Society, Kolkata, an Institution of National Importance, The event was marked by an one-day seminar presided over by Professor Dilip Kumar Biswas. An exhibition of Dr. Bagchi’s writings and photographs depicting his life and work was inaugurated by Prof. Dilip Kumar Sinha, the then Upacharya of Visva-Bharati University. The present collection is based mainly on the papers presented at this seminar inaugurated by Dr. Pratap Chandra Chunder, the well-known scholar and educationist, who in his short but compact inaugural address brings out some of the salient features of Dr. Bagchi’s account of the mutual impact of China and India on each other’s life and culture. Dr. Dilip Kumar Biswas, a distinguished scholar known for his enduring contribution to Ram Mohan Roy studies, in his keynote address, delves into the characteristics of Dr. Bagchi’s scholarship and expatiates with profuse instances, many of them unknown to most of us, his excellence as a linguist and his deep awareness of the entire Asiatic background of Indian civilization. The author’s incisive analysis unravels the versatility of Dr. Bagchi’s knowledge and his amazing depth of specialization, as well as his mastery over classical Tibetan and ancient and medieval Indo-Aryan languages. 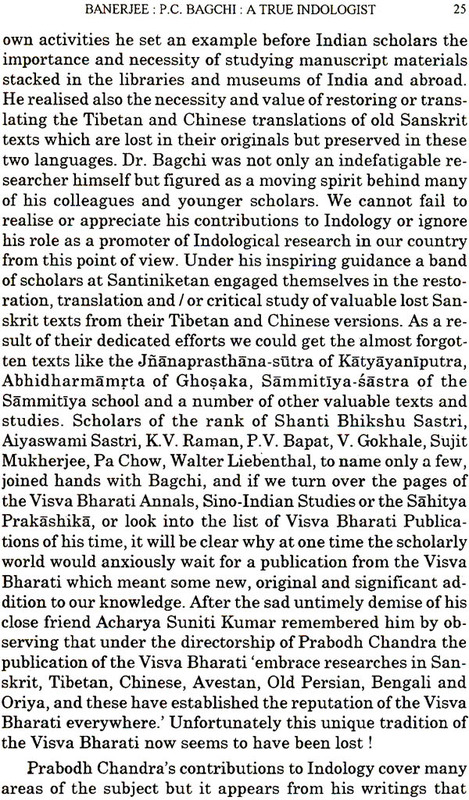 Prof. Bishwanath Banerjee, the doyen of Indian Studies at the Visva-Bharati, with his intimate knowledge of Dr. Bagchi’s contribution to Indology, rightly remarks that Dr. Bagchi always depended on scientific approach and thus enriched the treatment of his subject by profuse textual evidences. His grounding in the three classical languages like Sanskrit, Pali and Prakrit, his deep knowledge of Tibetan and classical Chinese together with a thorough acquaintance of the literatures in these languages gave a stamp of undisputed authority to whatever subject he researched. The author has to be thanked for drawing our attention to Bagchi’s findings that Buddhism has not been a passing phase like so many other religious creeds or movements in India, but has exerted an abiding and all-pervading influence on all aspects of Indian society. He has also made an empathetic analysis of Bagchi’s studies on the Tantras, Dohakosa and other works. Of the two papers on Indo-Chinese (also called Sino-Indian) studies Dr. Haraprasad Ray’s paper gives an outline of some of the facets of Bagchi’s contribution to Chinese Studies in India, while Narayan C. Sen takes up anew some of the much discussed points of Dr. Bagchi’s well known paper entitled “Political Relations Between Bengal and China in the Pathan Period” published in vol. I of Visva-Bharati Annals, (1945, pp. 96-134). However, it needs to be noted that the scholar glosses over some of the points about which definitive conclusions have already been arrived at by previous scholars; and at times, jumps to unwarranted conclusion or hypothesis. In the course of dealing with Dr. Bagchi’s contribution in the field of Tibetan Studies Prof. Suniti Kumar Pathak has afforded us an overview of the scope and extent of Tibetan Studies in India. We are told that Dr. Bagchi based his studies on original source material in Tibetan language. Like the western Indologists he used the Tibetan and Chinese sources as primary or secondary evidences for cross examination and authentication of the available data; the Mahnmayuri Tantra, Dohakosa and Caryapada are cited as examples. Dr. Kalpika Mukherjee’s essay is a study on the study of the “Geographical Catalogue of the Yaksas in the Mahamayuri” a long discourse by Dr. Bagchi published in 1947. She confirms Bagchi’s thesis which places Chinese translation of Mahamayuri to the third or fourth century A.D., and goes on to assert that the Yaksa cult must have established itself in India long before that, that is, before the commencement of the Christian era. Malavika Bandyopadhyaya’s article is a critical review of Dr. Bagchi’s Bodhicitta-bivarana of Nagarjuna confirming Bagchi’s view that the style and quality of Sanskrit goes in favour of attributing the authorship to Nagarjuna, the proponent of the Madhyamika school. The papers included in this volume show that Prof. Prabodh Chandra .Bagchi with his holistic approach and uncanny knack for arriving at the correct picture never flinched in dealing even with the enigmatic or the insignificant points. He used his profundity and depth for exploring India’s past amidst the plethora of hitherto untapped data in central Asian, Chinese and other writings. The essays in this small volume are dedicated to the memory of this savant of deep commitment and prodigious gift of scholarship. The editor expresses his heartfelt thanks to Professor Bishwanath Banerjee, the President of the Asiatic Society for taking initiative in bringing out this publication. He is also beholden to Ms. Ratna Sinha, daughter of Dr. Bagchi for providing the data for the contents of part two.